Why we love them: Plastic pots and containers are great value for money and very lightweight which makes them perfect for balconies, rooftops and decks. They also easily adjust to prevailing temperatures and are quick to heat up and cool down, so they protect delicate root systems. There’s also lots of variety in shape, size and colour – some are even designed to look as if they’re made from natural materials like terracotta. Great for these spaces: Balconies, rooftops, decking, patios. Perfect for these plants: All plants, but especially good for bedding and small herbaceous plants. Why we love them: Dark plastic pots look stylish and chic, but you need to be careful with position – generally, it’s best to keep dark-to-black plastic pots in the partial to full shade as they do heat up very, very quickly in full sun and this may damage plants if left in sustained sunshine for long periods. Great for these spaces: Balconies, rooftops, decking, patios. Perfect for these plants: Shade-tolerant plants, like hostas and geraniums. Why we love them: The traditional terracotta pot is very stylish, a warm, brown buff colour that looks great in any space. It’s fun to customise your pots by painting or stencilling them. A couple of things to bear in mind, though. Terracotta is porous and absorbs moisture from the compost, so a little extra watering may be necessary. They are also prone to cracking and crumbling in very cold weather, so try and buy a frost-resistant type. Great for these spaces: Lighter pots fine for balconies, rooftops and decks. And if you’re looking to create a Mediterranean garden, terracotta pots are a perfect addition. Why we love them: Usually glazed, ceramic pots come in lots of different colours and sizes and are highly decorative. They’re also slightly heavier, so they can support bigger plants and are less prone to toppling. They’re less porous than terracotta, so waterlogging may be a problem. Always check when buying that they have holes in the base. They’re easy to chip or break in frost, so you may find that they’re better for indoor plants. Great for these spaces: Courtyards, patios Perfect for these plants: Great for architectural plants such as cordylines and grasses. Why we love them: Made from waste pulp fibre combined with clay, fibre-clay is very environmentally friendly and is an unusual alternative to traditional pot materials. They come in a huge range of designs such as traditional pot shapes, troughs and cubes. Great for: Adding a ‘structural’ feel to your space, ideal if you want a more formal look. 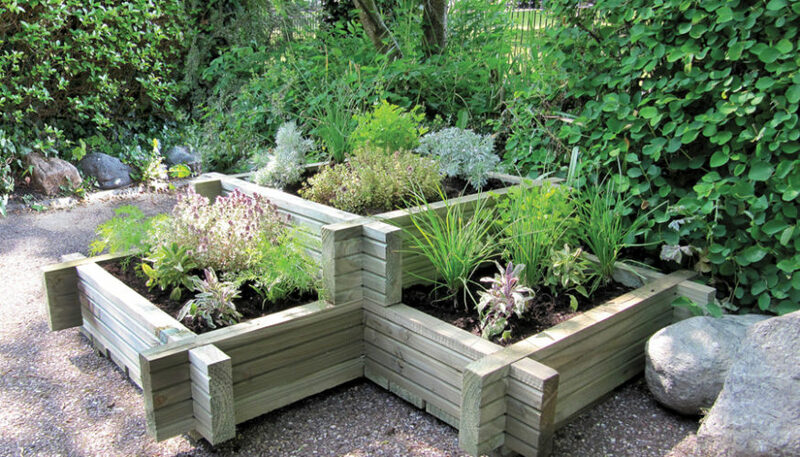 Perfect for these plants: Formal garden plants such as box, grasses, shrubs and many different perennials like geraniums, pansies and petunias. Why we love them: They give an ‘antique’ look to your garden and can come in a variety of ‘classic’ Grecian or Roman styles; and the good thing is, they last forever. Great for: Creating a feeling of permanence in your space. Perfect for these plants: Ideal for trailing plants like ivy, lobelia, petunia, begonia.